The world is a large place with thousands of indigenous tribes spread over the five continents and oceans. Thousands of objects have been produced both for use within these tribes and for trading. A general rule is that items made for home use are generally more valuable than items specifically for trading with other tribes. There are four main regions of interest to the Collectors: the Americas, Africa, South East Asia and the Pacific Islands. These regions can, of course, be subdivided into more localised areas and the tribes themselves. 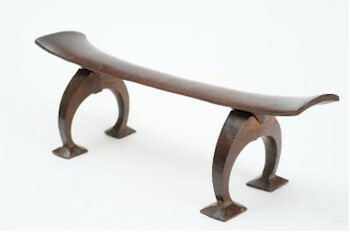 A late 19th/early 20th century Tongan Headrest that realised £4,600 at auction (FS19/613). Not all collectors work by region or tribe, some work by themes such as African masks, carved wooden fertility figures, tribal weapons, pottery, beadwork, metalwork and such like. The popularity of certain items, such as African carved wooden masks, has led to the importing of modern carved examples, which whilst decorative are not valuable. So genuinely old pre-contact pieces are at a premium whilst post-contact pieces do not command such high values. The Americas provide a vast array of subject matter. From Eskimo (Inuit) art in the far North through the West Coast Indians with their carved argillite totem poles and figures, the Plains Indians of Central American with well known tribes such as Sioux, Blackfoot and Cherokees through to the Inca and Quimbaya tribes of South America. The Quimbaya civilisation was best known for their work in gold and silver and was based in the valley of the Cauca River in what is now Columbia. This civilisation lasted until about 1500AD. Probably the most common items from these people to come to auction are their pottery "Flat Figures". These terra-cotta figures are normally square with thin slit eyes and mouth and simple limbs. They often appear to have tranquil faces. Mostly seated and often waving one arm. These friendly looking fertility figures, although old, normally realise in the region of £50-£80 each. Africa provides one of the richest sources of tribal art, its figures, masks, weapons and works of art are highly sort after. The main collectors tend to come from countries who had colonies in Africa, so France, Belgium and Holland are amongst the strongest buyers. The most popular area of collecting is probably masks, with dance, fertility and funeral masks being the most prevalent items. 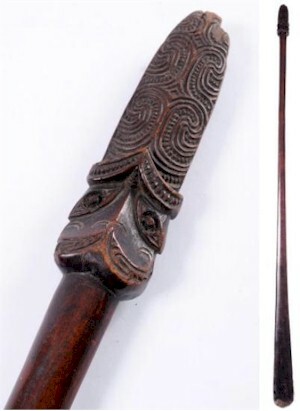 A Maori Taiaha (Spear) of Traditional Design (FS14/686), which was sold at auction in April 2012. The last great area for collectors is the Pacific, Australia, New Zealand and the thousands of small islands that make up the colourful tapestry of the Pacific Ocean. Maori pieces always create a great deal of excitement. One of the most familiar items to come under the hammer are nephrite pendants of Hei-Tiki, the Maori god of good luck and fertility. They have been steadily increasing in price over the past few years. The final port of call is the island of Fiji and probably the most popular items to come from the island are the war clubs traditionally decorated with zigzag bands and can realise anything from a few hundreds of pounds to over a thousand pounds. One thing comes through loud and clear - Provenance. When was the piece acquired? what was its history? Has it been in the same family since it was acquired? These are of vital importance to the prospective purchasers and collectors. With a good provenance, this will push pieces above the normal and into the collectable. With the Internet, the world has suddenly become a lot smaller!